OSHA recently released a memorandum on “Inspection Guidance for Inpatient Healthcare Settings” (click to be directed to OSHA document). The memorandum establishes guidance for inspections conducted in inpatient healthcare settings, North American Industry Classification System (NAICS) Major Groups 622 (hospitals) and 623 (nursing and residential care facilities). Healthcare facilities are greatly affected by slip, trip, and fall accidents to workers and patients every day. Greater enforcement of standards for walkway safety will have a lasting positive impact when implemented consistently. OSHA’s long-awaited final rule revising protections for general industry workers from falls, slips and trips is undergoing review at the White House Office of Information and Regulatory Affairs (OIRA). Getting the revisions finalized will be a great step forward in creating wide-spread prevention of slips, trips and falls in our work places. These revisions should also help businesses to understand what regulations must be followed. At Traction Auditing we are closely following the OSHA revision in anticipation of a positive change. For those seeking consultation on these revisions and how they may affect your business, we would be happy to help, contact us today. The Occupational Safety and Health Administration announced Thursday that it would crack down on hospitals and nursing homes for workplace hazards that aren’t protected by formal rules. Experts say politics have complicated efforts to formalize workplace regulations. With the growth in popularity of hard-surface flooring and coatings, globalization, advancement in technologies, floor failure and slip-and-fall costs soaring into the billions, the importance of following industry and trade standards of care prudent to the related industries has become critical. With this significant growth and fast paced evolution, now more than ever, as related-industry professionals, we owe it to our clients and end users to pause and review this evolutionary process, evaluate how these changes have affected the inter-industry relationships, and identify the new challenges we face moving forward. In today”s litigious society it seems everyone is looking to blame someone for something, and unfortunately in the cleaning business, this often includes the dreaded slip and fall accident. In years past when a slip and fall accident would occur, the liability would fall solely on the company where the incident occurred. But, this is no longer the case since there has been a growing trend that, along with the company or corporate entity that owns or leases the property where the accident occurred, others have been included. Are Slips and Falls the New Asbestos? Each year hundreds of individuals file claims of asbestosis. 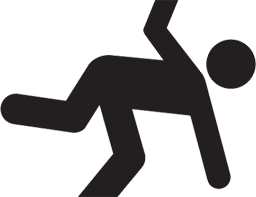 A number dwarfed by the 25,000 fall-related fatalities and 8 million Americans who seek emergency room treatment for an accidental fall. More people will either die or become seriously injured as a result of a slip and fall than that of asbestosis yet we have not seen any television ad reaching out to slip and fall victims. That day may soon be coming and the reason may be right under our feet! How to Define Standard of Care? The foundation for any plaintiff’s case is to establish that the defendant “failed to exercise reasonable care” and because of such was negligent. So what exactly is the standard of care in a slip and fall case? To answer this, one must uncover the standards defendants must meet and the standards plaintiffs must prove were violated. New National Standards For Slip and Fall Prevention Game Changers? We have all slipped and fallen at some point in our lives and know the horrifying feeling of an uncontrolled fall. In fact, if a member of your jury pool is one of the more than 8 million Americans who annually seek emergency room treatment for an accidental fall, your lawsuit becomes personal.Industry statistics reveal that falls are the leading cause of accidental death for the elderly and one of the leading causes of employee and guest injuries for many property owners. According to the National Floor Safety Institute (NFSI), 55 percent of slips, trips and falls are caused by a hazardous walkway. However, many property owners don’t realize just how slippery their floors are until someone slips and falls.